We are delighted that the Tallis Voices and Pepyllyng Wynde consort, led by Dr Christopher Lovell, are again putting on a concert in aid of our Trust. 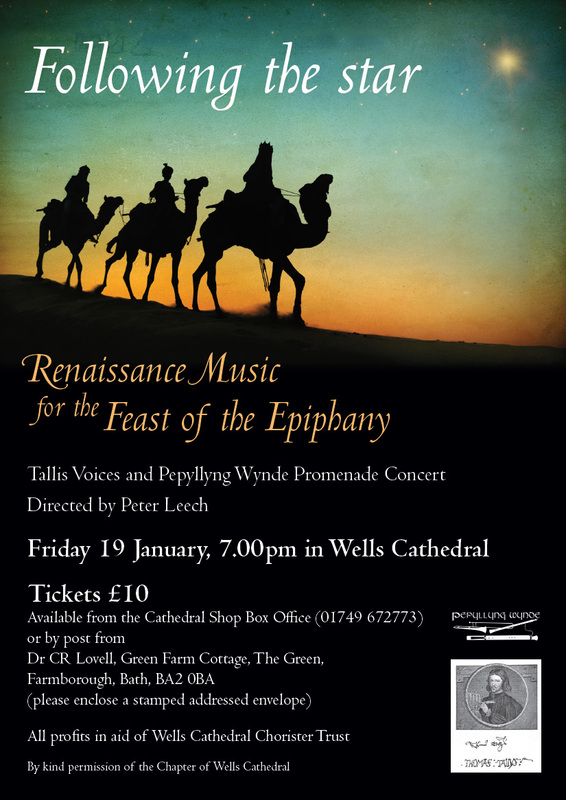 The concert is given as part of Wells Cathedral's series of Promenade Concerts. These take place throughout January when the nave has been cleared of all furniture, allowing the audience to wander through this wonderful medieval space. The concert is at 7.00pm this Friday 19 January and is entitled Following the Star: Renaissance Music for the Feast of the Epiphany. It promises to be a wonderful treat. Tickets are £10 and are available from the Cathedral Shop Box Office (01749 672773) or by post from Dr C R Lovell, Green Farm Cottage, The Green, Farmborough, Bath, BA2 0BA (please enclose a stamped addressed envelope).